Parents in New Zealand are being warned that they could face fines or prison time for buying Grand Theft Auto IV for their kids. Bill Hastings, chief censor at the Office of Film and Literature Classification, claimed his agency began receiving calls from retailers wanting to know how to respond to parents who wanted to buy the game "with their 14-year-old beside them," according to a report in the New Zealand Herald. In response, Hastings said, "If it's perfectly obvious the parent is buying the game for the child, don't sell it to the parents. If a game is R18 it's R18 for a reason and it's illegal to make it available to anyone under that age." Although the 1994 law has never been enforced, parents buying the game for minors, including their own children, could face a 10,000 NZD ($7854) fine or three months in prison. But more than out of fear of being thrown in jail for exercising parental discretion, Hastings said parents should refuse to buy the game for their kids because of its extreme levels of realistic violence. "When the violence does happen in Grand Theft Auto, it is of a quality that makes it R18 - the degree of it, the intensity of it, the realism of it. When you shoot a body it reacts in a very human way. It's not just stickmen falling over. It looks real," he said. 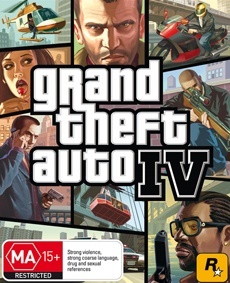 New Zealand gamers received the same edited version of Grand Theft Auto IV as the one released in Australia, but kept its R18 rating despite the game being cut to comply with Australia's upper-limit MA15+ rating. Specific reasons for the cuts to the New Zealand release have not been given, but Gameplanet co-founder Simon Barton said he assumed it was simply a matter of "logistics."